This is a card about balance. I would say it's about working too much, but these days, we all do that. If it isn't the job that keeps the lights on and food in the fridge, it's all the other tasks we have to do for everyone else. We all don't have the luxury of being able to take time off from our jobs, or from our responsibilities, so most of the time, we all just do the best we can. This card is urging to you squeeze in some time for you. It doesn't have to be a big thing. It doesn't have to be expensive. It doesn't have to be too time-consuming. But from time to time, we all need the reminder, especially from ourselves, that we matter. So what can you do for yourself that will make you happy? Can you take an hour to go to the beach, or a lake, or a park, or somewhere that you enjoy spending time with just you? How about spending some time listening to music that you love? Or reading a book (or at least part of one)? Or driving through In 'N Out for a milkshake? Just a little something to remind yourself that you deserve to be happy. 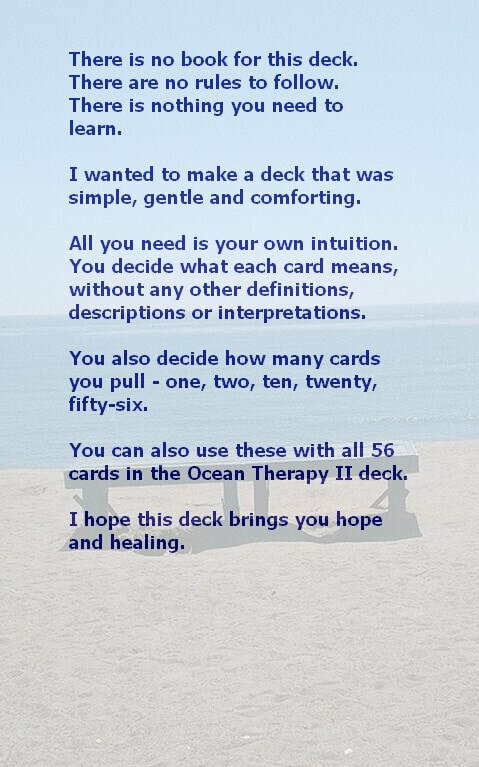 I will also be giving readings with this deck at Myztic Isle in La Mesa, CA today (Monday) from noon to 5:00pm. Get directions or make an appointment by visiting Myztic Isle's website RIGHT HERE! In this sketch by John Lennon, John and Yoko are pictured running away from photographers, an early-1970's version of paparazzi. Tame by today's standards, but they still felt that they were always under the microscope, anytime they ventured out in public. Some would say that's the price of extraordinary success and celebrity. Of course, paparazzi today have ratcheted that up to an alarmingly invasive degree, and it's hard to still believe that it's deserved by those who achieve that kind of success. I don't feel that this card reflects that kind of fame, though. Today, we're all famous (or, at least, most of us are). If you're on social media, in addition to your own circle of family and friends, you are probably connected to many others (some of which, you don't really know at all). And when you post your thoughts, dreams, theories, philosophies, rants, etc., many more people than you realize get to see them. Those who agree, and in some cases disagree, are apt to like, comment or share those posts with their circle of friends. And so on. You have the opportunity to influence, to some degree, many more people than you ever probably thought you would. Not long ago, before there was even MySpace, that seemed pretty far-fetched. But now it's so easy, you don't even realize it. That's what I think this card is about. It's about thinking twice before you post something online, even if you're so very sure that your shrouded in privacy. It's about responsibility. If what you want to post isn't something that you would say to someone in person, or it's something you wouldn't want someone else to hear, consider not posting it at all. We expect celebrities to live up to certain standards, and to act responsibly when they give interviews or engage with others on social media. Now that it's so easy to connect with so many, we should all live up to those standards. ​You can hear me read from this deck for callers on Psychic Tapestry's Spiritual Tune Up Show with Michele Amburgey on Wednesdays, and on Psychic Tapestry's Love Show, with Toni DeMaio and Julia Hoffman, Fridays on Blog Talk Radio! I will also be giving readings with this deck at Myztic Isle in La Mesa, CA on Monday from noon to 5:00pm and Saturdays from 1:00pm to 6:00pm. Get directions or make an appointment by visiting Myztic Isle's website RIGHT HERE! 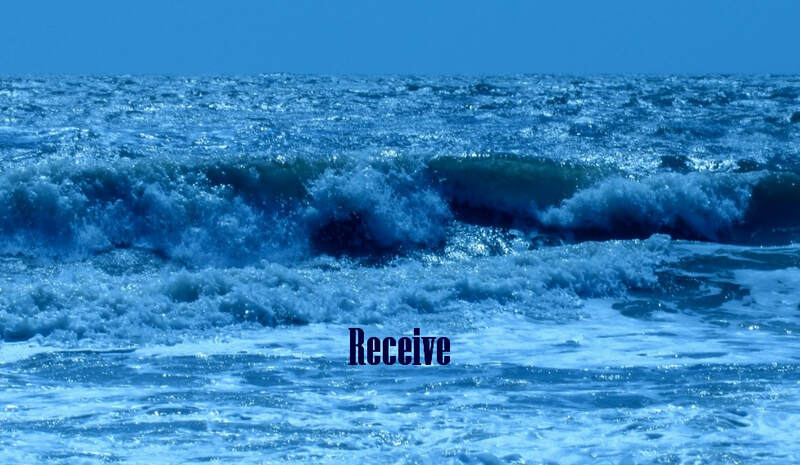 What does "Receive" mean to you? Many see that word and think of a gift or some kind of payday. And if that's what first strikes you, then it's quite possible that's what this means for you. To me, it's a bit more than that. I don't think of it as something tangible. I think of it more as a follow-up to what happens when you "allow". Gaining knowledge, healing and support when we ask our guides and angels for it, and then prepare ourselves to we are ready to receive it. So often, we spend so much time thinking of what we want, whether it's a shiny new car, a loving relationship, a fulfilling career or something else. But how much time do you spend preparing to actually have any or all of those things? Sometimes, it can be as simple as acknowledging that you need help, and willing to accept it - from your friends, your significant other, your family or your guides and angels. But that's what it means to me. This card also mean something completely different to you, and that's absolutely valid. That's how this deck works! This is a card about perspective. 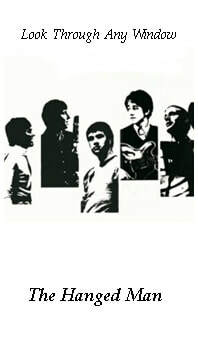 The Hollies' song, "Look Through Any Window", is about walking down the street, and looking in the windows of different houses. In each case, you catch a glimpse of the story that's unfolding there. But not the whole story. This is true of any interactions you have with others. Regardless of what you know, or what you think you know, you're only witnessing a small part of their story. That's something that is all too easy to lose sight of, especially when the part of the story you're seeing isn't something you like or agree with. You'll never really know the whole story. Even if it's someone you're very close to. And that's okay. They'll never know your whole story, either. But it is something to consider when dealing with others. Don't leap to judgments. Don't rush to condemn. And don't be so sure you know how you would have done things differently. Instead, choose compassion. Choose understanding, especially when you find it so difficult to understand - you can still choose to understand that you don't understand, and that's okay. And above all, choose love. This card comes from my Psychic Jukebox deck, a 78-card tarot deck that I created. It is similar to traditional tarot decks, but all the cards are singers, bands and songs. My deck is actually 80 cards, as there are two blank ones - because sometimes, you already know the answer. I think there are a couple messages in this song. First, whether you believe it or not, the Universe wants you to be happy and wants you to have everything you want. Actually, the Universe wants you to have more. The trick, though, is figuring out what you want. We had a caller on one of our shows recently, who said she didn't understand why she felt depressed - she had a job (and she worked hard at it), she had a family she loved (who also loved her) and she had a home. Why wasn't she happy? A couple of questions proved that, while she did have all those things, she wasn't doing what she wanted. She was doing everything that everyone else expected her to do. I suggested that she take time, however much she can spare whenever she can spare it, and start to make a list. This can be on a legal pad or in a notebook, or even in a Word doc. And it should be a list of everything she wanted. This could include a new car, new clothes, new everything. A better job. Healthier food. More free time. More disposable income. And then keep going with that list. Are you hungry? Add a Whopper to the list. Are you tired? More sleep. It should be as extensive as possible. When the list is complete, let it sit for a day or two. Then, go back over it. And cross out the things that aren't that important. Then, take a look at what's left. Pick a few of those that are the most important. And then make a plan to get them. These things probably won't be something you can get right away. But the act of making some kind of progress shifts how you feel. Try to make steps towards each of these as often as possible, ideally every day. And after a month, even if you don't have any of them, yet, you'll feel like you're making progress. You're actively pursuing what you want. And that makes such a difference. The other part of this is gratitude. Before you go to sleep each night, think about what you're grateful for. I come up with eleven things each night, and I try to make them be things that I'm grateful for from that day. Some days, it's very easy. And some days, it's very difficult. Your grateful list is unique to you. It can be full of big things or small things. Or a mix. People that are close to you. A safe place to live. A job that pays when it's supposed to pay. Food. Clothes. Whatever makes you feel grateful. Doing this at first might seem like so much homework. But keep at it. And before long, you'll find that you're easily coming up with more things for which you are grateful. And you will feel grateful. Feeling grateful for what you have opens you up to attracting and receiving more. And you'll find that it no longer matters if you have everything, or even anything, on your long list, because you are so happy, so filled with joy, so grateful for every thing (and every one) that you do have. I've posted Andrea's original video of this song below. I hope you'll give it a listen. I often find listening to the music helps clarify the messages. 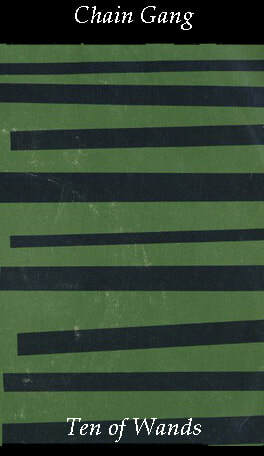 ​This song comes from my Psychic Jukebox, which has over twenty thousand songs in it. I set it to play randomly, and ask my guides and angels to give me the song that was the message that was needed. I also use my Psychic Jukebox in the readings on Psychic Tapestry's Love Show, heard on Blog Talk Radio Fridays and on our new Spiritual Tune Up Show, which is on Blog Talk Radio every Wednesday. And I use it in my readings at Myztic Isle on Mondays (12:00pm to 5:00pm) and Saturdays (1:00pm to 6:00pm)! You can get directions or make an appointment by visiting Myztic Isle's website RIGHT HERE! 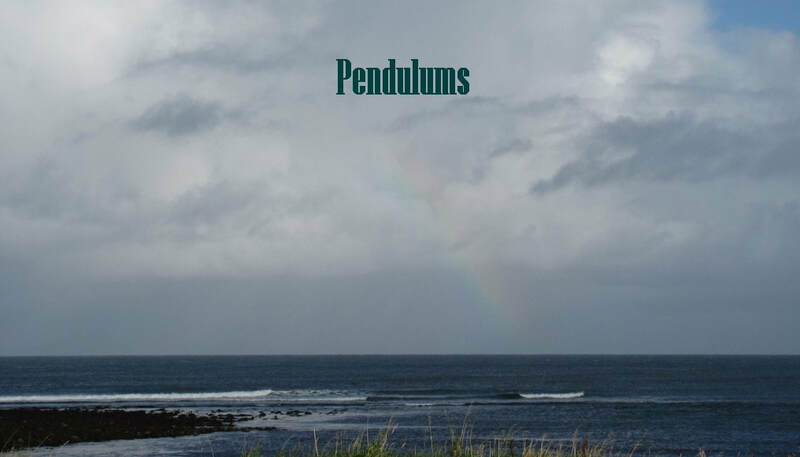 What do Pendulums mean to you? For me, they are rocks on strings, crystals at the end of a piece of chain, tools used for spirit and angel communication. It's not quite that simple, though. I think of Pendulums as a terrific gateway tool for spirit and angel communication. And I feel that way because it's a way you can get instant validation. You can see the proof. You ask for a "yes" or a "no" and you get a response. Learning to use, and trust, your intuition is not easy. But, at least for me, using pendulums was very easy. And through that, I learned to trust my intuition. I also learned to focus my intention. And I learned to be aware of how my thoughts and feelings could become an influence for whatever I was doing. The three I's - Intuition, Intention and Influence. Today's message is pretty simple. You rock! This isn't about ego, and it's not suggesting that you are better than anyone else. But it is a reminder that you are amazing. You deserve everything you want, and you are worthy of it all, and more. So often, especially when things don't go the way we want, we start to think that we aren't that good. We tell ourselves we aren't smart, we aren't attractive, we aren't worthy of love. None of that is true. You are all those things and so much more. You just need to believe it. You need to like yourself. And you also need to love yourself. The truth is, if you want others to feel that way about you, you need to feel that way about yourself, first. And you should. Because you are the greatest! This card comes from my Psychic Jukebox deck, a 78-card tarot deck that I created out of my love of music. It is similar to traditional tarot decks, but all the cards are singers, bands and songs. 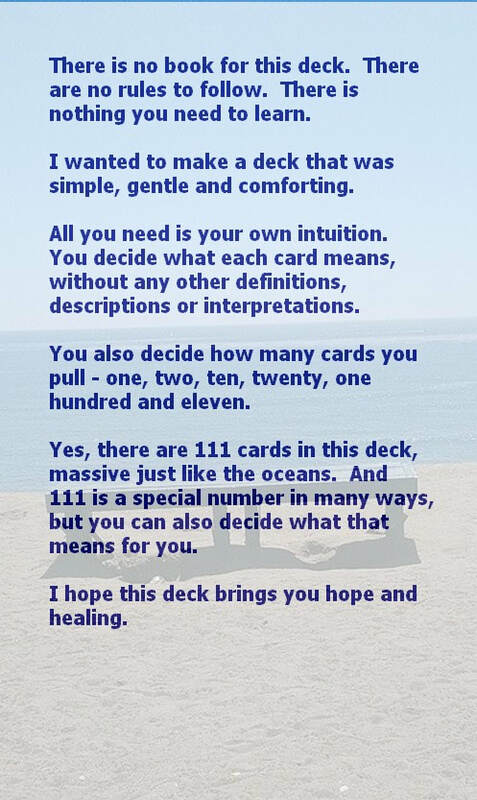 My deck is actually 80 cards, as there are two blank ones - because sometimes, you already know the answer. I will also be giving readings with this deck at Myztic Isle in La Mesa, CA on Mondays from 12:00pm to 5:00pm and on Saturdays from 1:00pm to 6:00pm. Get directions or make an appointment by visiting Myztic Isle's website RIGHT HERE or call 619-465-3005! 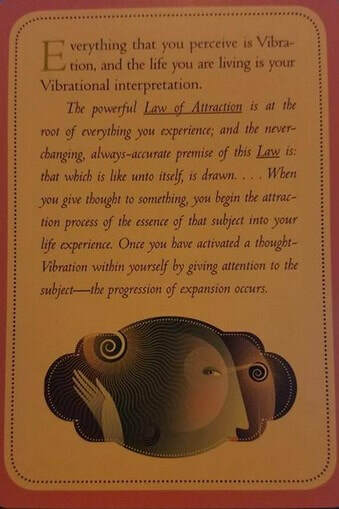 "That which is like unto itself, is drawn..."
"Everything that you perceive is Vibration, and the life you are living is your Vibrational interpretation. The powerful Law of Attraction is at the root of everything you experience; and the never-changing, always-accurate premise of the Law is: that which is like unto itself, is drawn...When you give thought to something, you begin the attraction process of the essence of that subject into your life experience. Once you have activated a thought-Vibration within yourself by giving attention to the subject - the progression of expansion occurs." So what does that word mean to you? For me, it's reminder to live your life. Too often, we spend too much of our time waiting. For lunchtime. For 5:00pm. For Friday. For the weekend. For birthdays and holidays. We wait for the perfect job. We wait to start our diet. We wait for love. It's almost like, at times, we become afraid to live our lives. You're the captain of your ship. It's up to you to make things happen. If the job, the healthy lifestyle and the love haven't found you, go find them. And if you aren't ready to find them, don't put your life on hold until you are. Go out and do things. Be with friends and family that you care about (who care about you). If you don't have a circle of people that you can do things with, go do things, anyway. Remember what makes you happy, and go and do it. Dance. Go to movies. Watch the sunset. 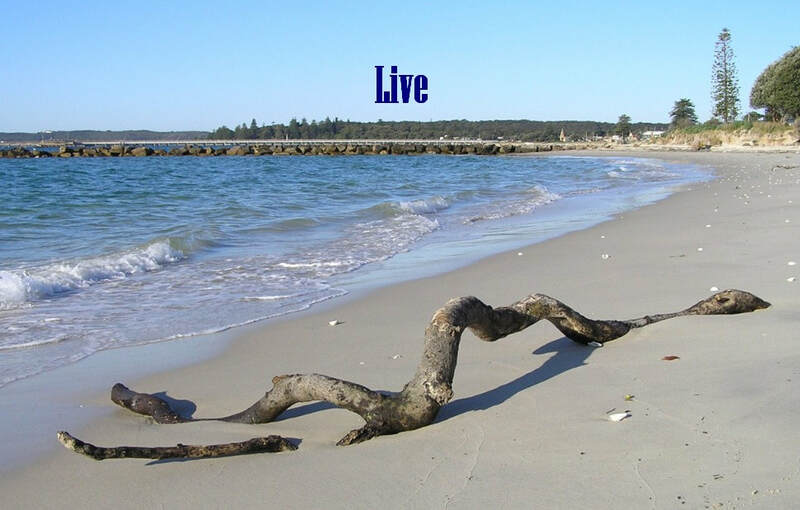 Ken is away working on a project and will be unable to post daily readings until the end of July. We apologize for the inconvenience, and hope you'll check back when the readings return!